In situ hybridization of wild type Drosophila embryos at different developmental stages for the RNA from a gene called hunchback. In situ hybridization is used to reveal the location of specific nucleic acid sequences on chromosomes or in tissues, a crucial step for understanding the organization, regulation, and function of genes. The key techniques currently in use include: in situ hybridization to mRNA with oligonucleotide and RNA probes (both radio-labelled and hapten-labelled); analysis with light and electron microscopes; whole mount in situ hybridization; double detection of RNAs and RNA plus protein; and fluorescent in situ hybridization to detect chromosomal sequences. DNA ISH can be used to determine the structure of chromosomes. Fluorescent DNA ISH (FISH) can, for example, be used in medical diagnostics to assess chromosomal integrity. RNA ISH (RNA in situ hybridization) is used to measure and localize RNAs (mRNAs, lncRNAs, and miRNAs) within tissue sections, cells, whole mounts, and circulating tumor cells (CTCs). In situ hybridization was invented by Joseph G. Gall and Mary-Lou Pardue. 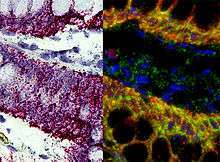 For hybridization histochemistry, sample cells and tissues are usually treated to fix the target transcripts in place and to increase access of the probe. As noted above, the probe is either a labeled complementary DNA or, now most commonly, a complementary RNA (riboprobe). The probe hybridizes to the target sequence at elevated temperature, and then the excess probe is washed away (after prior hydrolysis using RNase in the case of unhybridized, excess RNA probe). Solution parameters such as temperature, salt, and/or detergent concentration can be manipulated to remove any non-identical interactions (i.e., only exact sequence matches will remain bound). Then, the probe that was labeled with either radio-, fluorescent- or antigen-labeled bases (e.g., digoxigenin) is localized and quantified in the tissue using either autoradiography, fluorescence microscopy, or immunohistochemistry, respectively. ISH can also use two or more probes, labeled with radioactivity or the other non-radioactive labels, to simultaneously detect two or more transcripts. An alternative technology, branched DNA assay, can be used for RNA (mRNA, lncRNA, and miRNA ) in situ hybridization assays with single molecule sensitivity without the use of radioactivity. This approach (e.g., ViewRNA assays) can be used to visualize up to four targets in one assay, and it uses patented probe design and bDNA signal amplification to generate sensitive and specific signals. Samples (cells, tissues, and CTCs) are fixed, then treated to allow RNA target accessibility (RNA un-masking). Target-specific probes hybridize to each target RNA. Subsequent signal amplification is predicated on specific hybridization of adjacent probes (individual oligonucleotides [oligos] that bind side by side on RNA targets). A typical target-specific probe will contain 40 oligonucleotides, resulting in 20 oligo pairs that bind side-by-side on the target for detection of mRNA and lncRNA, and 2 oligos or a single pair for miRNA detection. Signal amplification is achieved via a series of sequential hybridization steps. A pre-amplifier molecule hybridizes to each oligo pair on the target-specific RNA, then multiple amplifier molecules hybridize to each pre-amplifier. Next, multiple label probe oligonucleotides (conjugated to alkaline phosphatase or directly to fluorophores) hybridize to each amplifier molecule. A fully assembled signal amplification structure “Tree” has 400 binding sites for the label probes. When all target-specific probes bind to the target mRNA transcript, an 8,000 fold signal amplification occurs for that one transcript. Separate but compatible signal amplification systems enable the multiplex assays. The signal can be visualized using a fluorescence or brightfield microscope. The protocol takes around 2–3 days and takes some time to set up. Some companies sell robots to automate the process (e.g., Intavis InsituPro VSi). As a result, large-scale screenings have been conducted in laboratories on thousands of genes. The results can usually be accessed via websites (see external links). ↑ O'Connor, Clare. 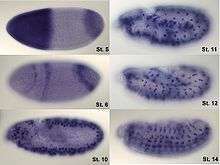 "Fluorescence In Situ Hybridization (FISH)". Nature Education. ↑ Gall, JG; Pardue, ML (June 1969). "Formation and detection of RNA-DNA hybrid molecules in cytological preparations.". Proceedings of the National Academy of Sciences of the United States of America. 63 (2): 378–83. doi:10.1073/pnas.63.2.378. PMID 4895535. ↑ Gall, Joe. "Albert Lasker Award for Special Achievement in Medical Science". Lasker Foundation. Jin, L; Lloyd, RV (1997). "In situ hybridization: methods and applications". Journal of Clinical Laboratory Analysis. 11 (1): 2–9. doi:10.1002/(SICI)1098-2825(1997)11:1<2::AID-JCLA2>3.0.CO;2-F. PMID 9021518.